Although I have a discussion on tendonitis elsewhere on this site, I thought I would devote a whole discussion to Achilles tendonitis as it is probably the most common tendonitis occurring on the foot and one of the most common tendon diseases occurring in the body in general. It is estimated that Achilles tendinopathy pain accounts for upwards of 20 percent of all athletic injuries. Typical of most athletic injuries, the range of severity is wide, but there is always the chance that a minor injury will transform into a major injury if adequate measures are not taken or the patient tries to “run” through the injury. Men, over the age of 40, are more prone to damage to the Achilles tendon, even rupture of the tendon due to the fact that as we age the structure of the tendon becomes more rigid and therefore more prone to tearing. 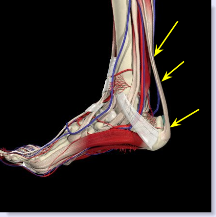 the attachment of the tendon into the back of the heel (bottom arrow). The anatomical make-up of the Achilles tendon is somewhat different than most tendons in that instead of having a “synovial sheath” which is a covering surrounding the tendon, the Achilles tendon is surrounded by a loose fatty layer of tissue known as the paratenon. Two problems with this type of anatomical arrangement is that the paratenon supplies the Achilles tendon with most of its blood supply, so healing of the Achilles tendon is very much dependant on the integrity of the paratenon and secondly, the paratenon itself is subject to injury. Many people will sustain injury to both the paratenon and the Achilles tendon resulting in adhesions (scarring) between the two structures that will lead to further reduction of motion and an increase in pain. The most common causes of Achilles tendonitis are poor training techniques particularly by older athletes. Inadequate warm-up, a rapid increase in mileage, or rapid increase in intensity of other sports will put excessive tension on the tendon. For runners the type of surface used for running can have a negative impact on the Achilles tendon. Concrete surfaces do not allow for any shock absorption on impact and thus the shock of the foot hitting the ground results in damage to the posterior musculature including the Achilles tendon. Running on uneven surfaces such as sand or a “banked” road results in more expenditure of energy by the lower leg muscles making the Achilles tendon more prone to injury. Running uphill applies more strain to the Achilles tendon increasing the possibility of injury. Poor athletic shoe selection can also create Achilles tendonitis. A shoe that constantly rubs and irritates the back of the heel may eventually lead to irritation of the tendon. A poor shock absorbing athletic shoe will put more strain on the Achilles tendon. An athletic shoe that does not adequately hold the heel bone (calcaneus) in place may also put unnecessary strain on the Achilles tendon. Foot structure will also play a role in the development of Achilles tendonitis. A foot that over pronates causes the Achilles tendon to overwork and may lead to injury. A foot that over supinates is a poor shock absorbing foot and this too may lead to inflammation of the tendon. Tight Achilles tendon is probably the biggest cause for pain in the tendon. Many people unfortunately have a tight tendon, meaning when they bend their foot upwards (with their knee locked in extension), they simply cannot bend their foot more then 90 degrees relative to the lower leg. This inability to bend their foot further than 90 degrees puts tremendous strain on the tendon. The main complaint by patients is pain in the back of the heel. 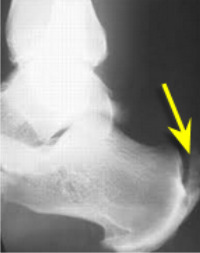 This pain needs to be distinguished from retrocalcaneal bursitis (see bursitis) or retrocalcaneal bone spur, along with some less common causes such as gout or Rheumatoid arthritis. The pain is most pronounced, when initially walking, after periods of inactivity such as sleeping or sitting for a long period. Walking around will generally decrease but not eliminate the amount of pain. When exercising the pain is most prevalent when jumping or pushing off. Actually pressing on the Achilles tendon may also elicit pain and you may be able to feel swelling along the course of the tendon. Most cases of Achilles tendonitis is diagnosed by proper history and physical examination. Squeezing the tendon may yield pain. Bending the foot upwards with the knee in a locked position will usually also cause pain. In individuals where there is Achilles tendonitis the patient will usually demonstrate a lack of dorsiflexion (the ability to bend the foot upwards beyond ninety degree relative to the lower leg with the knee locked). It is also recommended to test the strength of the tendon to rule out rupture of the tendon particularly if the pain occurred while exercising and a "pop" was felt. They also describe the rupture as if someone kicked them in the heel. Keep in mind that the tendon can rupture even with no history of exercise or trauma. You should attempt to stand up on your toes. If there is a tear in the tendon you will not be able to perform this test, or at the very least it will be very painful. Many times in a Achilles tendon rupture, you can actually feel a gap in the tendon where the tear has occurred. When the pain on the Achilles tendon is at the level where it attaches into the heel bone, an x-ray may be helpful to rule out other problems such as bone spurring on the heel bone and/or calcification of the tendon itself. In situations where the tendon does not respond to treatment or a tear is suspected, an MRI can be very helpful in evaluating for minor and major tears within the tendon, along with other problems such as calcification of the tendon. WHAT IS INSERTIONAL CALCIFIC ACHILLES TENDINOSIS? This condition has been described as an overuse injury particularly in long distance runners as well as jumping sports, skating and skiing. It is typically described by patients as pain at the point where the Achilles tendon inserts into the heel bone (calcaneus). The most notable finding in these cases is calcification of the Achilles tendon where it inserts into the heel bone. If the calcification is severe enough it can extend well into the Achilles tendon. This creates a functional shortening of the tendon, essentially because the calcified portion of tendon is no longer able to function as tendon. From a medical standpoint this is known as an enthesopathy which a disease process of the enthesis, which by definition is the insertion of tendon, fascia, muscle or articular cartilage into bone. The calcification of the Achilles tendon is due primarily to inflammation of the tendon. The Achilles tendon is under tremendous stress as it functions to help move the foot forward in gait. Athletic activities further stress the tendon at its insertion. Abnormal biomechanical function at the talo-calcaneal joint (the subtalar joint located just below the ankle joint) will also exacerbate the problem. In determining treatment for Achilles tendonitis it is important to first determine the cause. Elimination of factors that are exacerbating the problem such as poor athletic shoes, lack of adequate warm up or poor running surfaces all need to be addressed. It raises the heel slightly thus decreasing the tension on the Achilles tendon. Reducing tension reduces pain. An orthotic will also help absorb shock particularly in those with high arched feet. In people with flatter feet, an orthotic will create better alignment and better function of the Achilles tendon. This is an important point to note, because people with a tight Achilles tendon, will tend to have feet that flatten out. By pronating, this decreases the distance, ever so much, between the origin of the tendon and its insertion into the heel bone. By decreasing the distance, you decrease the tension. In order to reduce the complications associated with this condition conservative treatment should be instituted immediately. Icing the area will help reduce the inflammation and pain. In mild cases where you are still participating in athletics, I would advise ice both before and after exercise. Stretching of the Achilles tendon is also mandatory, however, it should be pointed out that for most people stretching will relax the tendon slightly but does not actually stretch it. Short term use of anti-inflammatory medication is also helpful. This type of medication is indicated for acute tendon problems and should be limited in chronic forms of tendinopathy because in chronic tendon problems there is no longer inflammatory cells within the tendon and therefore anti-inflammatory medication will be of limited value. If these simple measure do not seem to be helping, then cessation of the athletic activities (rest) is also mandatory. Remember, our goal here is to minimize damage and not let the condition worsen. Night splints for Achilles tendonitis is another means to reduce Achilles pain and aid the tendon in healing. This is accomplished through wearing a night splint during sleep. This keeps the Achilles tendon in its proper position while sleeping. In more severe cases a cam walker, or walking cast may be necessary to keep the tendon immobilized all day as well. The less the tendon is forced to stretch and over work, the quicker it will heal. In situations where these simple procedures have not helped then physical therapy may be necessary. This consists of a program where the physical therapist works on reducing the inflammation while at the same time tries to increase the flexibility of the Achilles tendon. We generally do not give cortisone injections for Achilles tendonitis particularly at the insertion of the heel because this has been shown to increase the chance of Achilles tendon rupture. If injectable cortisone is to be used it should be injected underneath the skin and not directly into the tendon. Other conservative treatments include extracorporeal shockwave therapy (ESWT) particularly in chronic forms of Achilles tendon problems. (PRP) or Platelet-rich plasma injections have been used for tendon repair in many parts of the body, however, most studies that I have read have not found the same degree of success in the Achilles tendon. In cases of rupture of the Achilles tendon, surgery is generally the indicated treatment. This is primarily true for younger active individuals. The exception would be in those individuals who lead a very sedentary life style or are not good surgical candidates. In these cases the patients are usually put in a cast for upwards of several months. is surgery the only option for a ruptured Achilles tendon? Interestingly enough, a study, albeit it a small one was conducted whose purpose was to measure outcomes of those who had complete open reconstruction Achilles tendon surgery vs. those with percutaneous tendon repair (small incision repair) vs. those that had conservative management. Three years post treatment, the subjects Achilles tendon was measured for calf muscle volume (a poorly functioning Achilles will cause the muscle belly to atrophy or shrink), cross sectional area of the tendon through MRI imaging, to measure the length of the tendon. They were also questioned about time lost from work or activity. Essentially the results showed no significant difference in calf muscle volume, Achilles length, and time lost from significant activity among the three different treatment approaches. During the acute phase of Achilles tendonitis, it would be wise to refrain from running as you are only looking for problems, one of which is rupture of the tendon. At this point you should be looking at other exercise options such as an exercise bike where you can still burn calories but the stress on the tendon is minimal. make sure you have some device in your running shoe, either an orthotic or at the very least, a heel lift to take some of the tension off of the Achilles tendon. avoid running up hills as this increases the tension on the Achilles tendon and can aggravate the condition. try and run on softer surfaces like a high school track and avoid sidewalks and streets as they put stress on the Achilles tendon. if you can tolerate them, take an anti-inflammatory 30 minutes before you go out to run. ice the Achilles tendon both before your run and immediately after. if you feel the pain worsening during your run, stop immediately. It is also worth noting that a class of antibiotics known as Fluroquinolones, more commonly known as Cipro and Levaquin, have an FDA warning attached to them, suggesting that these antibiotics can increase the risk of tendon rupture. Those individuals taking these antibiotics should be aware of this side effect.